It’s not just national governments attending the UN climate change summit in Paris. Many state and regional leaders are present as well, and often push for more radical action than their national counterparts. ‘Sub-national’ Canadian governments such as Ontario and Quebec are among the most active participants in a new Climate-KIC supported initiative, the Compact of States and Regions, which also includes European regions such as Scotland and the Valencian Region in Spain — as well as South Australia, where Climate-KIC is working on setting up a South Pacific Climate-KIC partnership. Launched in September 2014 in New York, with UN backing, the Compact tracks and reports progress by participating governments. It currently has the support of 44 states and regions together representing 325 million people and over US$10.5 trillion in GDP – one eighth of the global economy. This morning at COP21 (7 December), the initiative unveiled its first disclosure report, announcing targets that will result in cumulative emission reductions of 12.4 gigatonnes of ‘equivalent carbon dioxide’ by 2030 – more than the combined greenhouse gas emissions of the US and EU, and greater than China’s emissions in 2012. It would amount to 47.4 gigatonnes by 2050 – equal to the total world greenhouse gas emissions in 2012. 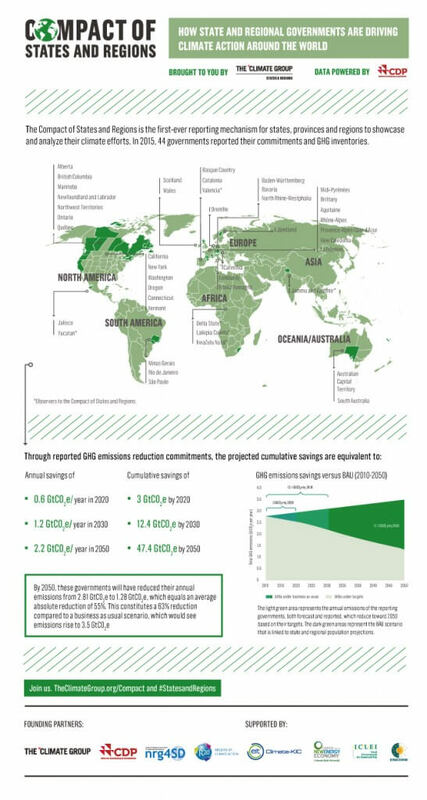 In addition to these cumulative emissions savings, by 2050 Compact governments from both developed and developing nations will have reduced their collective emissions by almost 55% in absolute terms. The report also revealed both near and long term goals, with almost half of reporting governments having already set 2050 goals. A majority of these aim for reductions of more than 70% below base-year emissions. 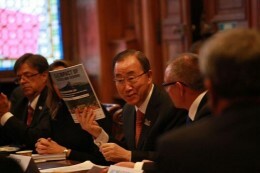 United Nations Secretary-General Ban Ki-moon being presented with an advance copy of the Compact of States and Regions ‘Disclosure Report’ by Premier Jay Weatherill of South Australia, at COP21 in Paris. “We have already been at the forefront of climate leadership for many years, setting ambitious climate and clean energy targets, and developing new and innovative policy responses. If we are already having this impact with 44 reporting governments, imagine what we can do with more,” she said.